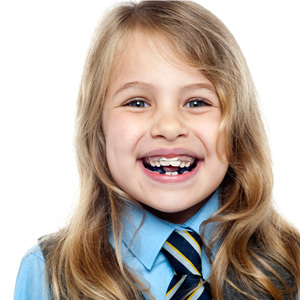 Children and teenagers are ideal candidates for orthodontic treatment! Because the jawbone is still growing, a young patient’s teeth are particularly receptive to orthodontic alignment and orthopedic / jaw growth modification. In addition to enhanced aesthetics, a straighter smile offers many oral health benefits including improved speech, better access for hygiene and increased self esteem! The American Association of Orthodontists recommends that every child has an initial orthodontic visit at age 7 (or earlier if oral or facial irregularities are present). Early intervention allows us to guide the growth of the jawbone, ensuring that permanent teeth come in straight. We do this by creating more space where teeth are crowded and regulating the width of the upper and lower jaw. This helps to avoid impacted teeth, which can cause root resorption (shortening of the tooth root) and other costly and painful complications later on. In addition, early orthodontic intervention can prevent irreversible enamel wear, gingival (gum) recession, and reduce the need for tooth extractions and even jaw surgery! Most bite issues are genetic or inherited traits, but they can also be caused or exacerbated by habits and behaviors that are common with young children such as: thumb/finger sucking, overuse of pacifiers, forward tongue posture habits, severe mouth breathing, early loss of baby teeth, cavities, poor nutrition and/or poor oral hygiene. To determine if your child will benefit from braces, we will start with a thorough initial examination. If orthodontic treatment is indicated, we may then obtain orthodontic records in order to accurately diagnose and treatment plan your child’s individual case. Orthodontic records typically include X-rays, photographs, bite impressions / digital models and 3-D images if indicated. Dr. Kaci then studies these records in great detail in order to determine the orthodontic treatment plan that will give your child the very best end result in terms of esthetics, function and stability. Braces are common among children and teens and most of our patients are excited to begin their orthodontic journey. Colorful bands can be added, giving kids a fun and exciting way to express themselves! As a child moves into the teen years, however, he or she may request a more discreet treatment method such as Invisalign® or clear braces. Whatever they choose, we are here to make their experience as comfortable and successful as possible. Give us a call for more information to see how we can positively influence your child’s life and improve their self confidence!